The most common species of Mice which pose a threat to homes or businesses are the House Mouse, Field Mouse and Yellow Necked Field Mouse. House mice are covered in short hair that is light brown or grey to black in colour, with lighter bellies. Their ears and tail also bear hair, although much less than their bodies. Adult Mice weigh approximately 12 to 30 grams and can grown up to 20cm from the nose to the tip of the tail. Droppings are rod shaped and pointed on both ends. Biology: Mice reach sexual maturity at five to seven weeks, their gestation period when pregnant is between 17 and 21 days. The litter size is usually between four and sizteen babies. One female can have 5 to 10 litters per year, so the mouse population can increase very quickly. Breeding occurs throughout the year. Control: After a site inspection, control measures will be put in place which may include baiting, trapping and proofing measures. The Field Mouse is the most common and widespread mouse species residing in the British countryside. This rodent was recognised as a distinct species in 1894. The Wood Mouse is a close relative of the rarer yellow-necked mouse (Apodemus flavicollis). It differs slightly in that it has no band of yellow fur around the neck, is slightly smaller in size, darker in colour and has smaller ears. 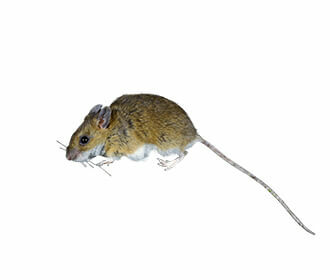 ully grown Wood mice measure around 8.1 – 10.3 centimetres from nose to tail. Their tails measure 7.1 – 9.3 centimetres in length and they weigh 13 – 27 grams. Wood mice gain weight during the summer. Wood mice have generally dark brown fur on the top part of their bodies with white/grey undersides. They have large protruding eyes, large ears and long tails. Biology:Wood mice breed from March to October, with a breeding peak from July to August. They produce 4 – 7 litters consisting of 2 – 9 young per year. Wood mice can reproduce quite frequently with the gestation period around 25 days. Females can breed at the age of 2 months. Young mice are usually out on their own after 4 weeks. This short parenting enables them to breed often. 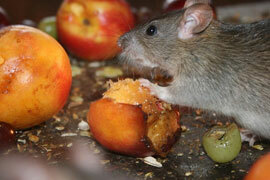 Wood mice have a life span of around 18 – 20 months, however, very few survive 2 winters. They tend to have a shorter life span of 6 – 12 months in the wild as many creatures prey on them . They live longer in captivity and when conditions are favourable. The two main types of rats that are a pest in both homes and businesses, are the the Brown Rat (or common rat) and the Black Rat. The Brown Rat is a moderatey large, robust, greyish or brownish rodent with coarse fur and a long sparsely haired, scaled tail. The tail is shorter than the combined length (Approximately 80%) of the head and body. This feature serves as a key identification character in differentiating this species from the black rat. The under parts and feet are greyish to white. Biology:Before their offspring are born, rats build nests from any material that can be foraged from the area, including branches, grass, trash and paper. These nests are usually built in crevaces, in rotting trees or in buildings. Rats, generally, are baby making machines. 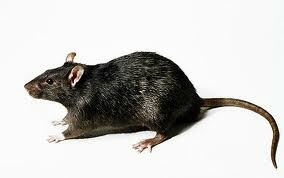 Female rats can mate around 500 times in a six hour period and brown rats can produce upto 2,000 offspring in a year. Brown Rats can have upto 22 young at once, though eight or nine is more the average. Control: A thorough inspection needs to be carried out and then control measures put in place which will include baiting, trapping and proofing measures if necessary. Black rats are rare in the UK. Their appearance is usually confined mainly to ports. The black rat is between 16–24cm in length, with a tail longer than the head and body. It grows to between 150–200g in weight. They have a pointed nose, large ears and a slender body when compared to the Brown Rat. Biology:Black rats produce 5–10 young per litter, and have between 3–6 litters a year. The gestation period is about 3 weeks. It only takes between 12–16 weeks from birth for them to reach sexual maturity.